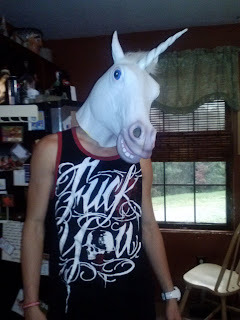 Unicorns do exist, and apparently appear in the shape of teenage sons with bad language on their shirts. The question is, do I try to ground him or make him pose for a photo? Clearly, this was the appropriate choice. Teenagers are why people drink and I needed a good excuse for a glass of Champagne anyway. Cheap Champagne, that is. My other option was a trusty ole PBR, but the Champagne makes it appear like I'm just sipping a drink and nobody counts how many glasses you've had until the bottle is empty.